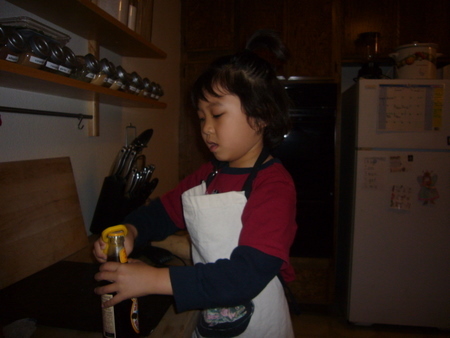 If memory serves me correctly... my newest Iron Chef began his tutelage under legendary Iron Chef BusyDad in the summer of 2005. 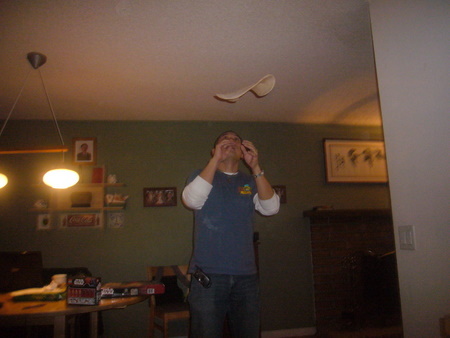 His journey into the culinary world began in BusyDad's kitchen, honing his creativity by finding ways to turn every kitchen utensil into a gun or a spaceship. As his apprenticeship progressed, this would-be chef cut his teeth by helping his master cut green beans. With a butter knife. Perhaps his actual teeth may have been a more effective tool for this, but an important lesson was learned. Dull tools sharpen the mind. And sharpen his mind he did, along with his craft. Known throughout culinary circles as the catalyst for the "kid gourmet" movement, Fury has dazzled critics and playgroups alike with his "rad" interpretation of traditional fare. Today, I welcome him to Kitchen Stadium as my newest Iron Chef. As this is his debut battle, and seeing as he can't reach the faucet, I have decided to bring his master, Iron Chef BusyDad out of retirement today for a very special tag team edition of Iron Chef. AND NOW, TODAY'S THEME INGREDIENT... FLOUR! Fukui: Oh! the Chairman has thrown us a curveball today by picking flour as the theme ingredient! So basic, yet complex! Yes, yes. Let's go to our commentator on the floor, Ohta for some play-by-play. Ohta: Iron Chef Fury doesn't seem at all flustered by today's ingredient, and in fact, he claims it'll give him the perfect opportunity to use a cookie recipe he found on the Backyardigan's website. Fukui: ahhh... using his deep knowledge of kid's entertainment to his advantage right off the bat. A brilliant strategy. Ohta: Iron Chef Fury informs me that he's actually going to cook dessert first! When I asked him about this strategy, he simply replied "because I like it." Ohta: Looks like Iron Chef Fury is pausing in the middle of his cooking to open a Newcastle. He knows what it takes to keep his master Iron Chef BusyDad in the game. He informs me that Iron Chef BusyDad will wander off otherwise. Fukui: What's that going on down there on the floor Ohta? Ohta: Ah, the four-legged team member, the family sous chef, Krypto. He peels the potatoes and chops garlic, and I am told he also performs on-the-spot cleanup duties as necessary, Fukui San. Fukui: Oh, Ohta, I'm noticing some activity in the Iron Chef's corner. Looks like gold and orange wrappers or something? Ohta: Why yes, Fukui san! You are right. Iron Chef Fury informs me they are Reeses Peanut butter cups. He plans on breaking them up and using them instead of chocolate chips. But first, he needs to test one. No, make that four. Fukui: Well all that testing of peanut butter cups seems to have paid off. We can smell those cookies all the way here in the stands. Japanese female star of stage and screen: ooooh! hee hee. That makes me soooo hungry! hee hee. Ohta: Iron Chef Fury has told me that his main course is going to be a pizza, but not just any pizza. A pesto pizza. 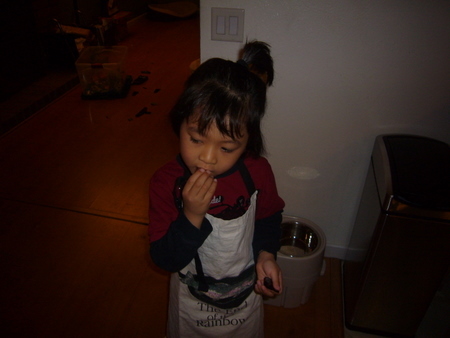 Anyone who says kids don't have a gourmet palate has never spent a day in this kid chef's kitchen! Fukui: Ohta, it looks like Iron Chef Fury just dumped a load of flour on the counter and is proceeding to roll it. Ohta: Yes Fukui san. I just spoke to Iron Chef BusyDad. His response? "Rookie mistake." A course correction has been made by the master. Fukui: Oh! Look at that! Iron Chef Fury is tossing the dough. What shape is that? Ohta: Iron Chef Fury tells me that he likes his pizza shaped like an amoeba. Ohta: Oh - Fukui san... this just in. Iron Chef BusyDad has stepped in. He tells Iron Chef Fury that there's no way his amoeba pizza is fitting into the pan. He's fixing it on the fly - a true professional. 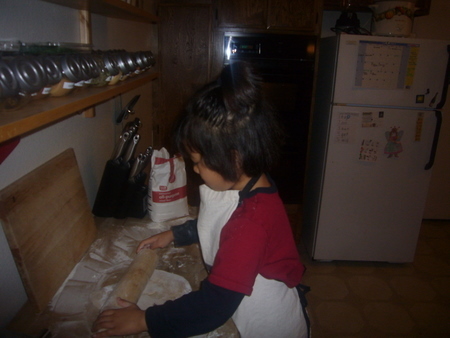 Iron Chef BusyDad: Good choice, young apprentice. Good choice. Ah! Pancetta. Looks like that'll do it. Iron Chef Fury: I want corn. Iron Chef BusyDad: Corn??? For pizza?? Iron Chef Fury: Well, I like corn. 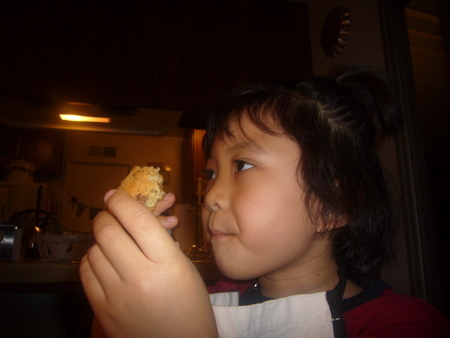 Iron Chef BusyDad: Okaaay, it's your creation. Let's do half and half to be safe. Fukui: Brilliant twist from the young chef! Have you ever heard of a corn pizza? Japanese female star of stage and screen: hee hee hee my grandmother loves corn. Maybe she will try some. Hee hee hee. Ohta: The Kitchen Stadium pantry only has a little bit of shredded asiago left. But Iron Chef Fury is taking no chances. He still gives it a good taste test. Hmmm. Looks like he ate pretty much all of it. Fukui: Pizza with "essence of Asiago" as they say. Heh heh. Ohta: it's ready to go into the oven. 15 minutes until judging. Down to the wire, Fukui san! Fukui: Ohta, what are they doing now? From up here, it looks like they are making a total mess of Kitchen Stadium. Ohta: Fukui san, that's an affirmative. Iron Chef Fury says that the flour makes for good war paint. They are beaming with confidence that victory will be theirs tonight. Fukui: And the contestants are plating their final dishes and in 4-3-2-1... The Flour Battle is OOOOVVAA! Chairman Kaga: And now for the judg-- hey! Kid!